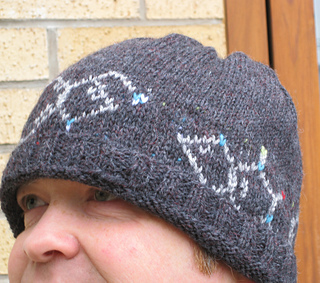 A beanie-style hat for organic chemists everywhere. Knit in the round, using dk/sport weight yarn on 3.75 mm needles, incorporating 4 important molecules. If you aren’t familiar with stranded colour work, read Theresa Vinson Stenersen’s tutorial on knitty.com. Heterocyclic molecules have atoms other than carbon (hetero-) in a carbon ring structure (-cyclic). The molecules on this hat are penicillin, serotonin, caffeine and theobromine (chocolate!). I’m new to pattern writing and chart design so please let me know if you come across any mistakes.